Afghanistan Cricket team celebrating their maiden test win, against Ireland. After recording a historic maiden test win against Ireland, Afghanistan are ranked fourth on the list of least number of matches taken to record a maiden test win, according to ESPN Cricinfo. 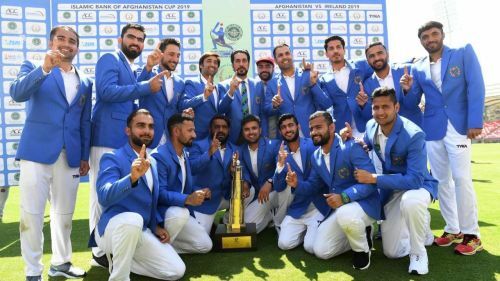 The Afghanistan cricket team registered their first test victory in the history of the nation against Ireland yesterday, 277 days after making their test debut against India. Afghanistan's batting pair Rahmat Shah and Ihsanullah Janat put on a fabulous partnership after Ihsanullah's fellow opener Mohammad Shahzad collapsed for just 2 runs off 34 balls. But Shah and Ihsanullah's 141 run stand for the second wicket made the difference between the two sides. Afghanistan had made their intentions clear since the beginning of the test, after having bowled out Ireland for a mere total of 172, and in return putting a first innings total of 314. Ireland failed to pull level in their second innings and could manage only 288 on the board, just for the Afghan team to finish off the match in style at 149/3. The Australian Cricket team still holds the first ranking in the least number of matches required to win a maiden test match, as the Aussies had won their first ever test match against England in 1877. England who are considered the inventors of the gentleman's game weren't ever going to stay behind in the rankings, and are placed second on the list with just two matches required to achieve the feat. The current International powerhouse of cricket, India, are ninth on the list with 25 matches required to secure their first ever Test win. It doesn't come as a big shock, as India weren't very good at Test matches until the early 2000s, especially overseas. Afghanistan with their win yesterday have become the fourth-ranked team on the list, with only 2 matches required to win their first test match ever. Though many would argue that it was a poor opposition Afghanistan faced in the form of Ireland, there will be many upcoming real tests for the Afghans in the ODI format as they play Pakistan and England in their opening World Cup matches. The next match for Afghanistan are their World Cup warm-up fixtures against Scotland on 8th and 10th of May, 2019.